There is a great story behind this photo, proudly displayed outside the door of our NYC apartment. 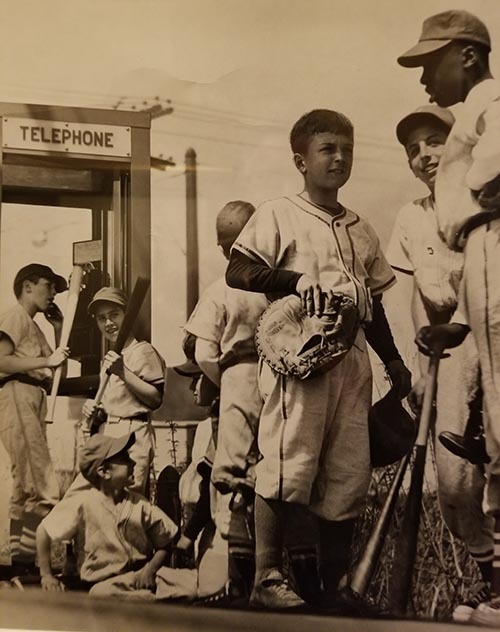 It was taken at the phone booth behind the Carvel store in Ardsley, NY after our Dobbs Ferry Little league game—I would guess around 1962(?). What’s hard to imagine in today’s world is that the photo was taken for an AT&T advertisement that appeared the NY Times, among other newspapers. Why AT&T was advertising is a mystery to me, as it had a total monopoly in those years; it was the only company providing either telephone service or telephones at the time (hence the simple label “Telephone” at the top of the booth). But it was a great day for us: we were each given $10 and a free Carvel – I got a brown bonnet with chocolate custard, as always. ONE OF THE KIDS WAS NOT ORIGINALLY IN THE PICTURE, AND WAS SUBSTITUTED IN AFTER ANOTHER KID’S DAD PURPORTEDLY EITHER OBJECTED THAT APPEARING IN THE AD WOULD JEOPARDIZE HIS SON’S AMATEUR STATUS AND/OR SOUGHT MORE MONEY FOR THE USE OF HIS SON’S PICTURE. CAN ANY OF THE DOBBS FERRY ALUMS ID THE SUBSTITUTE? CAN ANY OF YOU NAME ALL THE KIDS IN THE PICTURE? Joe Digugliemo Peter Paino Mike Baltimore Danny Barbone?Chris LueftenberG? Looks like Joe Digug was substituted in.